Vladimir Putin can only maintain Russia's importance by seeking the failure of other countries, Rep. Adam Smith (D., Wash.) said at the American Enterprise Institute on Tuesday. Russia is ruled by a failing regime, according to Smith, who said that Putin is "plotting" for "the collapse of the Western world," and the Russian government now operates under the guiding rule that "what's bad for the West is good for Russia." Smith said more of the world—and more of the United States—is aware of the threat posed by Russia than when he was first elected to office in the Washington state senate due to the rise of social media and the internationalizing of news. 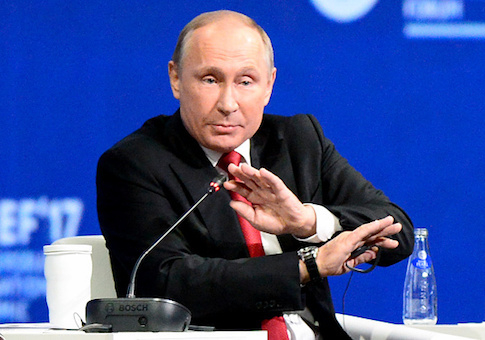 Joined in conversation by Leon Aron, resident scholar and director of Russian Studies at AEI, Smith pointed to Putin's willingness to undermine the European Union and NATO. He noted, as well, the nonstop effort to raise doubts about American leadership and electoral politics. All of this, Smith said, Putin does to injure the West and thereby make Russia's economic woes seem less bad. The Russian invasion of Ukraine ought to have shown the world that Putin wants to reestablish the Cold War in Europe. For the necessary work to oppose Putin, Smith told Aron, President Trump "isn't helpful." As the decline of oil prices and other exports continues, Russia grows more desperate, and nationalism proves the only card Putin has left to play. Both Smith and Aron agreed that Putin maintains his political power by using the media to tell a story of Russia resentment against the West: a tale of history, from Napoleon to the present, about oppression from Europe and America. The result, said Smith, is there is no more negotiating with Russia. "It's not worth it," the congressman said, and he mentioned his desire for new legislation that will help us "reestablish ourselves" as an opponent to dictatorships. Russia, Smith and Aron said, has never had a truly good government. Neither has it ever had real democracy. The ceaseless tradition of dictatorship and censorship has made the country a dangerous place. The United States needs to delegitimize Putin and get better information to Russian citizens—informing them how badly Putin has failed his country. Further, Smith told Aron, "We can reinforce the Baltic states" and employ tools such as NATO's Article 5. He also said further military aid to Ukraine is vital and increased funding for Voice of America and other outlets could help fight Russian misinformation campaigns. This entry was posted in National Security and tagged Adam Smith, Russia, Vladimir Putin. Bookmark the permalink.